Age can certainly improve a performer, as experience and mindfulness seep into the work. But there is something miraculous in the best of child actors, a purity and artlessness you know will eventually pass them by as their bodies mature and their self-awareness expands. Their innocence is uncoaxed, their transparency is unlearned, and their hurt and their joy live right there on the surface, in their eyes. They may be cute, but they’re not trying to be cute. “My Brilliant Friend,” HBO’s eight-episode adaptation of the first of Elena Ferrante’s four Neapolitan Novels, features a pair of astonishing turns by children. The limited series, about the long, complex friendship between Elena and Lila, breathtakingly renders Ferrante’s world on the poor outskirts of Naples in all its simple beauty and cruelty. But its first two episodes, set in the 1950s, are elevated most by Elisa Del Genio and Ludovica Nasti, who play the preteen Elena and Lila, respectively. They open up the magical thinking of youth, and show the nascent frustrations of being smart girls in a macho culture. They show us how the girls can be extremely sensitive to the nuances of adult behavior, but also resilient beyond their years. Most importantly, they establish our deep connection to and understanding of the two main characters, which will need to last across the series — and, as is planned, three more adaptations. After a brief framing scene, in which the older Elena (Elisabetta De Palo) gets a phone call that her longtime friend Lila is missing, we’re thrown back into the intimate daily lives of the two working-class children. Del Genio’s Elena is a reticent, bittersweet girl who’s considered the smartest in the class — until Lila lets her own natural intelligence show. They ought to be fierce rivals. While Elena, tall and fair, tries to be well-behaved, Lila, short and dark, is mischievous and, at heart, a rebel. But they click, and find warmth in their friendship despite the hardscrabble tenement world where they live and where domestic and mob violence erupt on a regular basis. We see them curled up together reading “Little Women,” a novel they worship and memorize, and it’s clear they’ve found a bubble of salvation with each other. The first two episodes unfold unhurriedly, revolving around illustrative vignettes — about whether they’ll be allowed to continue their education when their mothers need them at home, about what happens when they skip school, about their interaction with a local mobster, Don Achille (Antonio Pennarella) regarding their lost dolls. In episode three, Margherita Mazzucco and Gaia Girace take over the roles of Elena and Lila, respectively, and beautifully continue the portrayals into the teen years. Elena becomes more awkward, and Lila becomes scrappier and moodier, but the characters remain rooted in the earlier actresses. Director Saverio Costanzo brings us into a close relationship with the workings of the neighborhood, where everyone knows everyone else’s business, where marital discord erupts into screaming fights and pans flying out of the upper floors, and where Lila gets tossed out of a window by her father — and then, cut and bruised, smiles in defiance. It’s a perfect set, reflecting postwar poverty, dirt, and stasis, sunbathed but not romanticized. And the language — the Neapolitan dialect of Italian — is melodic and expressive enough to make the subtitles sing. It helps transport us to the very specific time and place of Ferrante’s epic story. 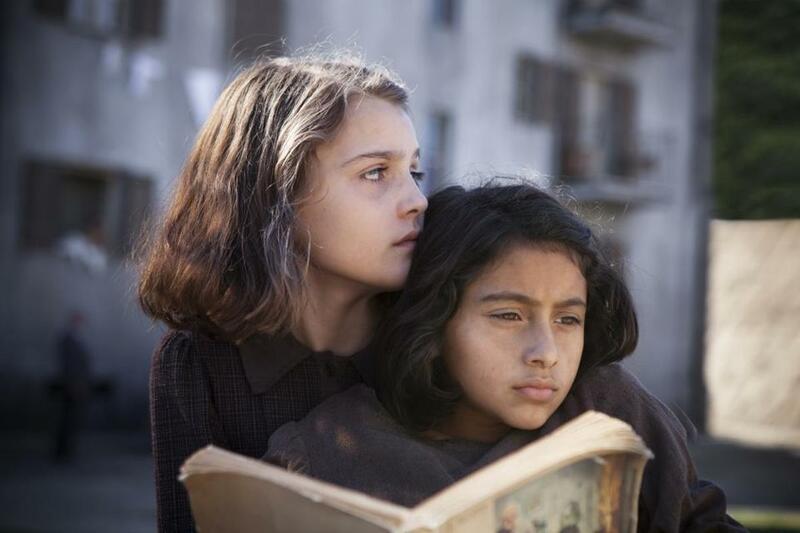 Insightful and clear-eyed, “My Brilliant Friend” takes you there. On HBO, Sunday at 9 p.m.